Watch throughout the day as the visual quality and characteristics of the fins change. 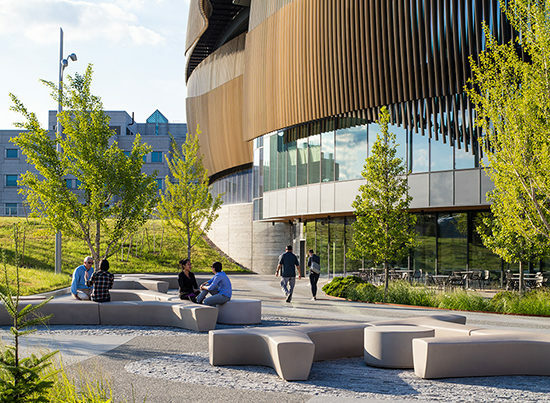 Flow and Movement define the form language of the Interdisciplinary Science and Engineering Complex at Northeastern University. Dynamic movement systems permeate the project, expand a campus and bridge two Boston neighborhoods. The architectural form is intrinsically linked with high performance architecture through parametric design and energy modeling. The sloping ground plane is defined by paths and clusters of spaces leading to the track crossing. The language of the paving flows in to the flooring of the atrium. Flanking the atrium are the lab bar and office pod. Defined by curved bronze anodized aluminum extrusions, the low energy office volume expresses the flow and movement systems of the landscape while shading the office space from the harsh southwestern exposure. The building enclosure is assembled with custom triple-glazed unitized curtainwall with exterior shading expressed by a veil of bronze anodized fins.